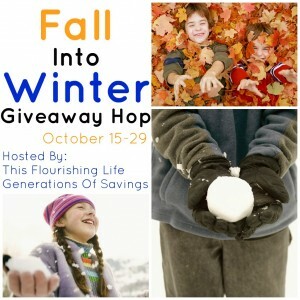 Here is your chance to win some great prizes for fall and winter each valued at over $25. 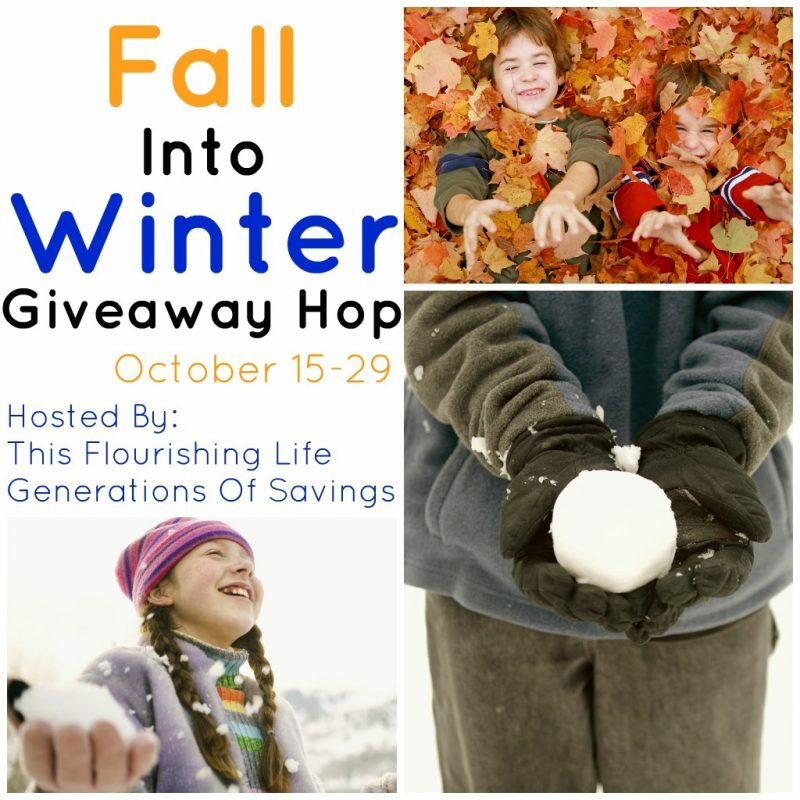 It’s the Fall Into Winter Giveaway Hop hosted by This Flourishing Life and Generations Of Savings! After you’ve entered to win our prize, be sure to hop to the other blogs and enter their giveaways on the linky below our entry form. Plus, the hosts are giving away four prize packs with a total value of $650+! Enter to win this Winter Bounty Wreath right here at Giveaway Bandit valued at $50! 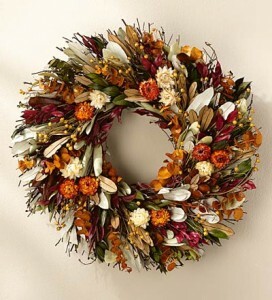 Bring the color and beauty of nature indoors this winter with an all-natural wreath of brown, cream and orange highlights on a natural twig base. Includes preserved intergrafolia, myrtle, painted eucalyptus, flax and natural flowers. Ready to hang. It measures 16″ in diameter. Enter to win via the giveaway entry form below. Giveaway is open to US and Canada, 18 years of age and older. Giveaway ends October 29, 2012 at 11:59 pm EST. Good luck! Disclaimer: Please note that the Fall Into Winter hosts and participating bloggers are not responsible for sponsors that do not fulfill their prize, but we will make every effort to help the winner in obtaining it. I do a lot of my Christmas shopping on Walmart.com or Amazon. I do most of my holiday shopping at Walmart. I love Asos, M&Co and Amazon! I usually do most of my shopping at Walmart. We do most of Christmas shopping at store like Kohl’s, Walmart and Target. I do lots of Christmas shopping at Amazon! I like to go to this little shop called Procter’s during the holiday season for ornaments and other decorations. But I do most of my Christmas shopping online. I do most of the Christmas shopping at Toys ‘r Us. I personally love to shop at Kohl’s for the women in the family and decorations. For the guys it is usually GameStop or someplace like that. JC Penney always brings back good holiday memories for me! If I loved closer, it would be my favorite holiday store. i love shopping at fireworks. they have something for everyone! I always shop at Amazon during the holidays. Thanks — the wreath is beautiful. Target, Marshalls and Ross. Thanks for the chance to win! I like online shopping mostly or JcPenney. I recently looked through the “Family Playroom” catalog, and my wife and I bought our major gifts from there – free shipping over $65. I don’t like the stores around the holidays! I try to buy my gifts throughout the year so I go to different stores and/or online. Online mainly or Macys, Target or specialty shops! I DO A LOT OF KID SHOPPING AT WAL MART AND EB GAMES, BUT FOR ADULTS I GO TO MANY DIFFERENT STORES-THANKS! For decorations my favorite is Home Sense, I also can buy presents for the ladies. I do most of my holiday shopping at Amazon.com. I don’t do a lot of holiday shopping. I give gift cards to Bed, Bath and Beyond or Bath and Body Works. Although, I love shopping at both of those stores year round too~! Kohl’s is one of my favorite stores! Lately, I have been buying Visa gift cards so they can buy what they want. Walmart, or Target is where I do most of my shopping. I like to shop at Target – Thanks! I love Target because they have unique reasonably priced items. We do our heavy lifting at Amazon. It Would Be Great To Win The Winter Bounty Wreath. In Response To Your Questions Of What Is Your Favorite Holiday Store? And Where Do You Do Most Of Your Holiday Shopping? And Check Out The Different Stores In Our Local Malls. I usually shope at Amazon since they have the biggest variety of products. thank you! I do the majority of my Christmas shopping at Meijer. I love bath and body works and walmart. I do my shopping at Target and Walmart. I do my Holiday shopping at Target and Walmart. i do most of my holiday shopping online. I do shopping online because I am not able to get out in the stores.